Successfully Added 2-In-1 USB Adapter (WIFI + Bluetooth) to your Shopping Cart. One amazing device that functions as BOTH a WIFI USB adapter and a Bluetooth USB dongle! Whether you're looking to create or connect to a small network or a large network, this baby is the solution you've been looking for! Why carry around 2 dongles in your pocket when one will do? Bluetooth - On the other hand, this incredible device is a top of the line Bluetooth adapter. Basically when you plug this adapter in any available USB port on your PC, laptop, or notebook, you'll be able to pair your computer with various Bluetooth devices like cellphones in order to transfer files and data. In fact, you can even create an informal Bluetooth network between your computers with this amazing tool. Simply get one of these adapters for each computer you want to be part of a network. Plug the adapters into the USB ports then run the software. The computers will detect one another and be able to exchange files and information with ease! If you're looking for that ultimate computer accessory, you've found it with this 2-In-1 USB Adapter (WIFI + Bluetooth) from Chinavasion - the online leader in direct from China wholesale electronics and dropshipping. Order yours today for personal use or resale and we'll ship it out tomorrow! Create your network in minutes! How fast is 54 Mbps? It means you're downloading at 54 MB per second. That means your average movie file of 700 MB, would be downloaded in about 14 seconds! How does this 802.11g WIFI adapter work? 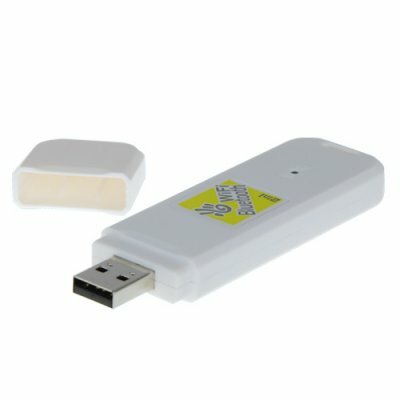 This high speed WIFI USB adapter is very handy if your desktop computer does not have a wireless internet card or you want to upgrade your existing connection to the "G" standard. Simply plug the adapter into an empty USB port and detect for WIFI signals. Once you find one, you can easily connect and start surfing the net. Ideal for Starbucks or other hotpost establishments where free wireless internet is offered. I know it mentions Vista, and although I have Windows 7 at first it did not work properly. I tried on a seperate computer that has XP and it worked a treat. No problems at all. Will play with files in Compatibility mode and get it to work. And will re post my findings. All in all fantastic, again the service and speed of delivery was great.